A teenage bank robber gets killed on-air, but each time it’s via recorded raw footage. This is Journalism 101 for a news producer: Do Not Air someone getting killed in your newscast. If you’re following a live situation and it looks tense, then you’re supposed to cut away. Thursday, February 10, marks a night where at least two North Carolina stations who do well in ratings failed the test. I’ll walk you through the situation in a moment, but I believe it’s imperative to point out that by all accounts, the airing of this video didn’t elicit much feedback or backlash from the viewing audiences. A young black man, Devon Mitchell, was shown being gunned down during dinnertime in the Raleigh, NC, market, and just before bedtime in the Winston-Salem, NC, market. This makes me think about footage of the piles of bodies in Haiti after the earthquake last year, or the floating bodies in New Orléans following Hurricane Katrina. As a society, are we more desensitized to when blacks are killed? The decision was made early to stop showing bodies falling from the Twin Towers in NYC after the planes hit them. Yes, there were victims of varied ethnicities in these major disasters, but the one that had a higher mixture of races got quicker nationwide results in preventing the country from viewing such atrocities. Arizona Congresswoman Gabrielle Giffords was shot in the head by a seemingly deranged man during a very public event. There’s been no video of the actual shootings released, to my knowledge. I, for one, am glad I didn’t see it, but I’m not naïve enough to believe at least some of it wasn’t captured in real-time by camera crews, cellphones, or surveillance video. So, more than likely, a concerted effort was made to not air the horrific video, if it exists. That’s fine, but that raises a question: are we placing a higher value on certain segments of society? Local television stations would probably get picketed for showing the congresswoman getting gunned down, or if they showed the elementary student at her event getting killed. They were victims of a senseless act, and they deserve some respect. Mitchell was at fault for his crime, but he and his family also deserved some respect. His family didn’t need to see their loved one’s death replayed like an 80-yard touchdown pass or a game-winning home run. 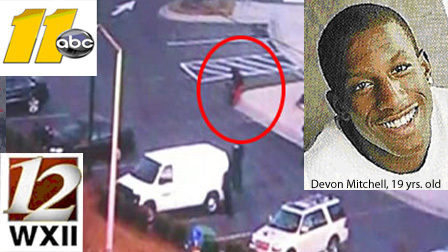 WTVD-TV in the Raleigh-Durham market was following the hostage situation at a Wachovia bank in Cary,NC The bank robber, Devon Mitchell, who was 19 years old, came out of the bank holding a woman hostage after three hours. The video, shot from a helicopter, shows the suspect pushing the hostage away, and then law enforcement officials begin to shoot the suspect multiple times, killing him. The suspect did not have a gun, but he told the hostages and negotiators he was armed. Here’s a package ran by WTVD-TV about the shooting investigation. WTVD went to a commercial break when the shooting and killing took place. That’s the correct move to make, but it is what happened next that’s reprehensible. The News & Observer, a Raleigh-based newspaper, reports that the station replayed the video on the air after the break. Yes, your jaw should drop. I don’t have any inside information from this station, so here’s what WTVD’s News Director, Rob Elmore, told the News & Observer about airing the raw video in his station’s 6 pm newscast. “We had no intention of showing a man being shot, and certainly we didn’t want to do that, and we regret that we did.” Elmore goes on to tell the paper the station intended to stop the video right before the shooting, but that didn’t happen. You can find the full News and Observer article here. If you can’t give the above station any excuse for showing the video after having a couple of minutes to reflect on the situation, then absolutely no excuse can be given for airing the raw video nearly FIVE HOURS after the fact. WXII-TV in Winston-Salem, NC, aired footage of the shooting that same night as the lead story of its 11 pm newscast. Full Disclosure: I worked two-and-a-half years for this station as the 11 pm producer, before I began teaching journalism full-time in January 2010. I wasn’t even watching the news the night it happened. My wife and I DVR’d the NBC show “Outsourced,” and watched it the following night. Since it is Sweeps Month, the 11 pm news flows seamlessly from the preceding primetime show. This allowed my DVR to record the beginning of the newscast. My wife and I both sat in disbelief when we saw a man being shot to death. I actually rewound it to make sure I had correctly heard the anchor say the robber was dead. I was thinking that there’s no way they’d show this if he died. There was no reason for me to witness the atrocity for a second time because my news ears heard correctly the first time. This is upsetting to me because while most young children are asleep by 11 pm, with DVR, this very scene could play out over breakfast, lunch, or dinner with the family. That is unacceptable. Thankfully, my wife and I don’t watch our nighttime programming with our girls, but some viewers might. A conversation with my 4-year-old about a man being shot to death on TV is one I’d rather not have thrust upon me by my trusted news source. The station aired the story as a VO (voice over = anchor reads the story while the video is playing) without disclosing to viewers that the video about to be aired was graphic in nature. The story ran 22 seconds, but the final seconds showing the suspect falling to the ground with quick bursts of smoke popping off of his body and off of the sidewalk were truly lasting images. You saw the bullets fly, and the body falling at about 24 seconds into the newscast. The entire story, including the show’s opening animation, was over in 29 seconds. Then it was on to the revolt in Egypt. Once my wife and I finished discussing what we saw, we went online to see if there were more details about the story. Knowing WRAL-TV in Raleigh, NC, has a great reputation for covering stories, I went to their site first. What I found was a news organization that truly lives up to its reputation. The station followed the event, but faded away from live coverage shortly before the shooting took place. This decision didn’t happen by accident, according the News and Observer. WRAL News Director Rick Gall told the newspaper they erred on the side of caution when the suspect walked out of the bank with a hostage. A little more searching and I ran across the WTVD information saying that they had run the shooting in their 6 pm newscast. The video was dark and grainy, and I hadn’t heard what time the shooting happened in WXII’s brief telling of it. I assumed the shooting took place just before the 11 pm newscast. The revelation that nearly FIVE HOURS had passed by and this video still aired got me to wanting to know what happened inside the walls of WXII that night. I reached out to multiple sources within the station and found out that there was a breakdown in communication. No sources will be named except the news director. The raw video was sent to CNN Pathfire (Pathfire allows CNN affiliate stations to download video from other affiliates from all over the country) by one of the Raleigh-area stations. The raw shooting video was downloaded and ingested into WXII’s tapeless system shortly after it was sent out by CNN. CNN pulled the video down from the server later in the night, so no one could use it, but WXII had already downloaded the video. This is where the breakdown in communication seemingly occurred according to my sources: there was either no communication or a miscommunication between the show producer and the editors about pulling the raw shooting video from the newscast. Either way, that can’t happen when you’re dealing with content as sensitive as someone being shot to death on-air. WXII’s News Director, Barry Klaus, gave this statement on the airing of the video via email. Airing that video didn’t seem to cause much backlash for either station, so I’m not sure what that says about our society as whole. You can fault the stations for airing the video, but there’s a much bigger issue here. There’s something wrong with our society when there’s little to no response when an unarmed robbery suspect gets gunned down on RECORDED TV. Since the incident was recorded, that makes showing the video all the more senseless. If you reversed the situation, and the suspect shot and killed an officer, would there have been more discretion placed on airing the video? Would the Raleigh stations have sent it raw? Would CNN have sent it out raw? This suspect, by all accounts, was a disturbed young black man. The assumption being made is that the 19-year-old wanted to be killed by the police officers. That is a fairly common situation known as “Death/Suicide by Cop.” I don’t know if race played a role in the various decision-making missteps, but it does make me wonder. If the young man were white, would his death be replayed on the local news? And if it were shown, would the backlash have been greater than what seemingly happened in this situation? The robbery suspect placed several people in danger, and I’m not letting him off the hook because he was in the wrong. But, no one deserves to have their death immortalized in HD, and the typical news viewer at home shouldn’t have those images stuck in their heads without their choosing. There’s a reason why we don’t air electrocutions and lethal injections on the news. I was in the news business for a number of years. I saw a lot of gruesome things that I couldn’t–and wouldn’t–show the public, but I thought I’d finished seeing those things, since I am no longer in the business and can’t watch raw footage from the news feeds. I’m going to use this incident as a teachable moment for my students, so that at least one future producer will have this in the back of their minds if it’s ever presented to them in a real-world scenario. I hope they choose to shield their audience, but who knows? Maybe the times are changing, and this is just a precursor to what’s going to be acceptable news as we continue to push the boundaries of real and reality. Share your thoughts. What’s more egregious: airing the recorded video of someone being killed on local news, or the lack of outrage from the audiences who saw the video?